We all secretly lust to be immortal. It’s too bad that our cells are programmed to reproduce only a finite number of times. If nothing else kills you, at some point your own cells will betray you and refuse to replicate themselves. It’s called dying of age. We are all programmed to die. In the movie The Curious Case of Benjamin Button we are entertained by the fictional story of a man who lives his life backwards. In the biography The Immortal Life of Henrietta Lacks by Rebecca Skloot we learn about the curious case of a woman who actually achieved immortality, sort of. Unfortunately, this poor African American woman from the largely unknown town of Clover in Virginia’s tobacco belt did in fact die in 1951. 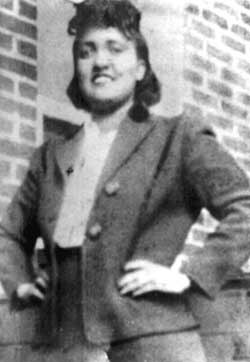 Henrietta Lacks died an excruciatingly painful death from cervical cancer at Johns Hopkins Hospital in Baltimore at the age of 31. However, some months before she died her physician performed a biopsy on her cervix to study her cancer cells. Her cancer cells turned out to be something of a Holy Grail in medicine: human cancer cells so virulent that they were almost impossible to kill and could be reproduced en masse for research. HeLa cells (HeLa for Henrietta Lacks), as they are known today, are used around the world today to test the efficacy of various drugs. HeLa cells have led directly to the discovery of all sorts of medical insights and cures. Unlike your cells, these cancerous HeLa cells prevent the incremental shortening of telomeres, which eventually causes a cell to not replicate. While the woman Henrietta Lacks has been dead nearly sixty years, her HeLa cells have survived and flourished and can be found in thousands of biomedical laboratories around the world. It seems likely that while there is life on the earth, HeLa cells will keep replicating. They may end up being the last thing alive on Earth. Some small and cancerous part of Henrietta Lacks has effectively achieved immortality. This book by the Jewish author Rebecca Skloot not only tells the fascinating medical story of the HeLa cells, but also the much more fascinating and often grim story of Henrietta’s family. The book is a candid story of Henrietta Lacks’s all too short life, her death and the largely dysfunctional African American family she left behind. It is also the story of a family whose lives were changed forever by their mother’s notoriety, even though they mostly lived lives in the shadows in Baltimore’s poorer and crime infested wards. It is also the remarkable story of its author Rebecca Skloot, a white Jew from Pittsburgh and her friendship with Henrietta’s daughter Deborah, who bore much of the baggage from her mother’s death. The book takes us into an intimate space unknown to most whites: poverty, systematic discrimination and the suboptimal African American experience. Those of us who truly believe that African Americans are still not being discriminated against need to read this often-heartbreaking book. Skloot was able to win over the family’s trust, but it literally took many years and required enormous perseverance. Skloot supplements the book with years of research, much of it spent with distant and not so distant relatives of Henrietta in and around Baltimore and Clover, Virginia. It turns out that the heart of this story is not Henrietta, whose life is already viewed through something of a distant mirror, but her daughter Deborah and her family. Their lack of advanced education made it impossible to understand why her mother’s cells were important. In a time of horrifying incidents like Tuskegee syphilis experiment, where African Americans were used in medical research by whites without their consent, it was not surprising that Deborah and the Lacks family believed that there were clones of their mother alive, or that others had profited off their mother’s cells while the family lived in poverty. Back in 1951 when Henrietta’s cervix was biopsied, there were no informed consent laws. Even today, tissues that you give to your doctor may be used for medical experiments without your consent. Billions were made from drugs made possible by the unique properties of HeLa cells. Research using HeLa cells arguably saved or extended millions of lives. The Lacks family certainly had reasonable grounds to feel that they were being shafted. However, no such “share the wealth” precedent existed, and no one was really to blame. In particular, Johns Hopkins Hospital was not to blame, as it was required by its founder to provide free care to the poor, which Henrietta Lacks used. Without Johns Hopkins Hospital, at best the Lacks family would have been deeply indebted by her getting treatment elsewhere. Finding treatment at all was challenging for African Americans at the time, as Jim Crow laws existed in Maryland. Today, the descendants of Henrietta Lacks still live largely in poverty in and around Baltimore. Most of Henrietta’s children are now dead, including the pivotal daughter Deborah. Many of Henrietta’s children and grandchildren came loaded with baggage and great anger. Many went to prison, some murdered and at least one remains in prison today. We also learn of a mentally ill daughter of Henrietta who was turned over to an asylum in Crownsville, Maryland, an institution so badly managed that it killed her daughter. Back in the 1950s, since it served Negroes, the citizens of Maryland for the most part did not care that it was overcrowded, understaffed, and filthy and crime ridden. Negroes were effectively second-class citizens. Skloot offers perhaps an unprecedented work of investigative journalism, a work that required an extraordinary amount of time, trust, probing and listening to the Lacks family. It was a labor of love that took more than a decade. I do hope that sales from this remarkable book will in fact be sufficient to create a substantial endowment fund for the Lacks family, as Skloot promised Deborah. And yet their story is simply one of millions of American families systematically marginalized and discriminated against, largely because they were born black. This book will haunt me for a while, and should haunt you as well if you read it. It is well worth your time to inhabit the world of Henrietta Lacks and her extended family. If this book is not a contender for a Pulitzer Prize for investigative journalism, it should be.